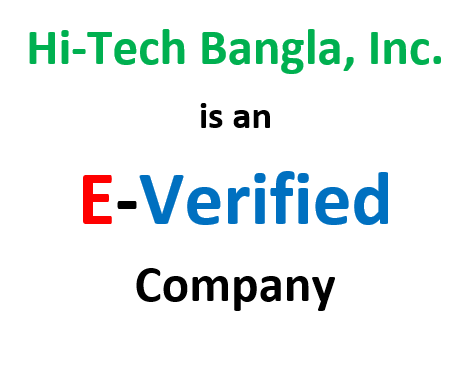 Hi-Tech Bangla, Inc. started its journey since 2008 in USA. Hi-Tech Bangla Group offers a full complement of specialized engineering, technical and management services to the Aerospace & Defense (AD), Energy Process & Utilities (EPU), Automobile Mobility & Transportation (ATM), High Tech (HT), Life Science & Medical Devices (LSMD), Floating Structures (FS), Heavy Machineries Industries (HME), Consumer Goods & Packaging (CGP), Financial Business & Services (FBS), Information Technology (IT) & Healthcare Technology Services (HCT) Industries through six different companies: Hi-Tech Bangla, Inc., Hi-Tech SoftSys (Bangladesh), Hi-Tech Bangla Staffing Services, Inc., Hi-Tech Bangla Information Systems, Inc., CAE SoftSys, Inc. and Hi-Tech SoftSys, Inc. HTB professionals are engineers, engineering group managers, manufacturing managers and program managers with proven track records of successfully working with local and international operators, prime contractors, subcontractors, service providers as well as research community. Its headquarter is in Irving, TX, USA. The other global location is Dhaka, Bangladesh.